Max & the Magic Marker debuted around the same time as BioWare's Mass Effect 2, making it one of many unfortunate casualties. The game received positive reviews, but we couldn't find the time to enjoy it while saving the universe. Thankfully, we'll get a second chance on iOS, courtesy of Electronic Arts and the original developer, Press Play. 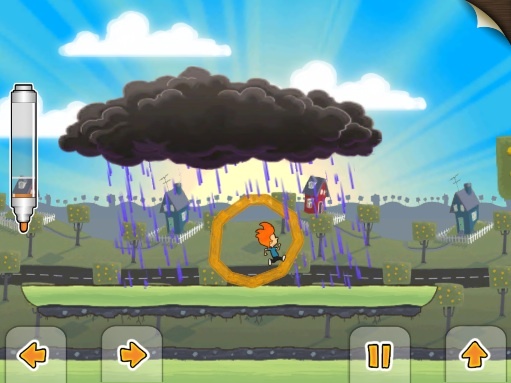 Previously released on Mac, PC and WiiWare, Max & the Magic Marker is a physics based puzzle/platform game where you guide a young boy (Max) through a fantasy world in search of a monster. The key feature is the ability to use a marker to make drawings directly on the screen. With the WiiWare version, you achieved this with the remote, but the iPhone/iPad edition is more tangible, since you're able to draw by sliding a finger along the screen. Throughout the game's 58 levels and three unique worlds, the primary objective of getting Max to the goal remains the same, but you can solve problems multiple ways. Since he lacks Mario's squashing ability, sketching an object is the best way to crush enemies. You can also draw a bridge to help him clear gaps, or a see-saw that functions as a catapult. And since water kills Max, encasing him within a circle is the best way to avoid death; he can also use this object to roll around the environments, similar to a hamster wheel. That said, the marker runs out of ink, so part of the challenge comes from using it sparingly while keeping an eye out for more. Meanwhile, the developers scattered gold and black spheres throughout the game, and collecting them all requires plenty of skill. Expect to think way outside the box. With this in mind, Press Play gives you an assist with Sketch Mode, where you pause the game (freezing Max and the physics) to plot the next move, and if you need some ink, tapping drawings or the marker erases them. For the most part, this is the same experience on the Wii with a couple exceptions, starting with the help system that displays dotted lines on the screen if you need hints on what to draw. In addition, the game has star ratings for each stage. You'll snag three stars if you finish a level with all the black orbs, two stars for grabbing the gold orbs and one star for completing a stage within a set time. 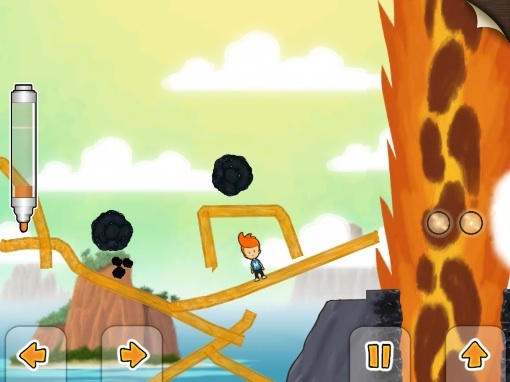 All of this makes Max & the Magic Marker one of EA's most anticipated iOS games. Check it out this March. After missing the first time around, we plan to do the same.